NEW - TI-84 Plus - EZ-Spot Teacher Packs include 10 Yellow TI-84Plus Graphing Calculators, each with a bright, easy-to-spot, "school bus yellow" back cover and slide case. They all come with a 1-year warranty. In addition, each unit's faceplate is inscribed with the words, "SCHOOL PROPERTY." 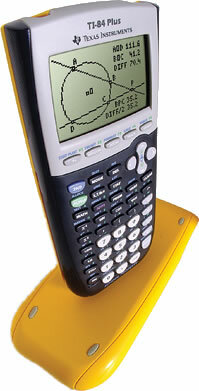 EZ-Spot calculators have the same features as regular TI-84 Plus family models in standard Teacher Packs and at retail. The only difference is the eye-catching color that makes them easy to identify as school-owned property. 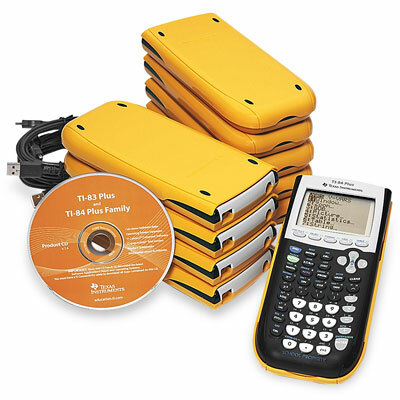 10 Easy Spot TI-84 Plus Graphing Calculators, 10 School Bus Yellow Slide Covers, 5 USB Cables, 5 Link Cables (Mini USB to Mini USB), 1 Manual with Apps on CD-ROM, and 40 AAA Batteries.